I had a chance to visit with Hope today. The pictures do not do her condition justice. Even after a week of intensive veterinary treatment, she still looks completely emaciated. Petting her side, you can feel each and every rib; her spine and hip bones are clearly evident through her fur. In fact, she is still at only half her estimated body weight. But as terrifyingly thin as she looks now, she is a hundred percent better than she looked about a week ago when we first met her. We received a call from Hoke County Animal Control about a retired law enforcement K9 that had just been seized for neglect. The dog was in very bad shape and needed immediate medical attention. T.A.R.A. took responsibility for the dog, named Hope, and immediately transported her to our emergency vet. 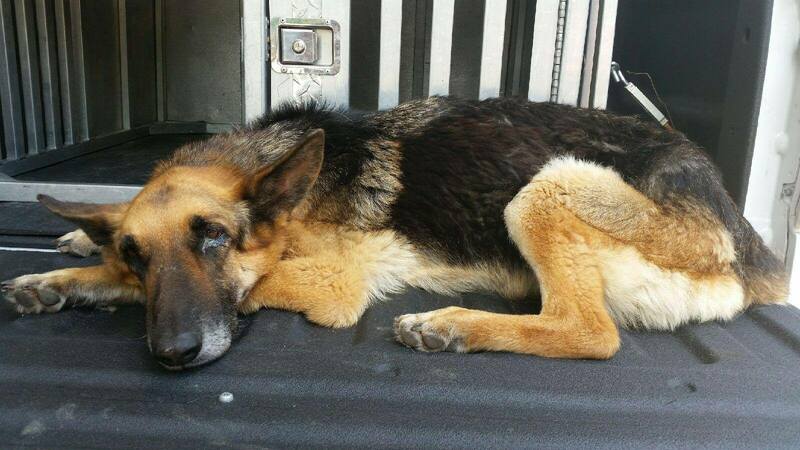 Hope was dehydrated and emaciated; our emergency vet rated her a 1 on a scale of 1 to 9 for body mass. 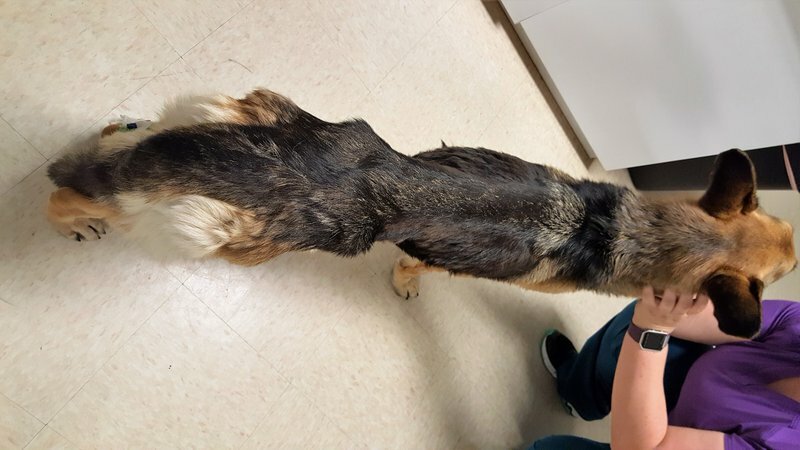 This is the worst case we have personally been involved with and we are staggered by the amount of neglect this dog has endured. She was started on small amounts of food to get her body used to eating and had to be treated for a massive infestation of intestinal parasites. This is a good indicator that she was forced to eat dirt and/or feces to survive along with whatever rainwater may have collected where she was tethered. S he was doing better through the week and was able to stand on her own after about 24 hours of care. Then she took a sudden and frightening turn for the worse on Thursday. After consultation with specialists at NC State, Hope was given a blood transfusion. Later that day she rallied and has since been doing much better. Today, when I visited her, she was accepting pets, drinking water, and walking on her own. She even made it vocally clear that she believed she should be fed every half an hour rather than every four hours. Hope will be able to go home to her foster’s house tonight and will remain under veterinary supervision until she returns to a normal body weight. We estimate that should take about a month. While Hope still clearly has a long road ahead of her, we are finally able to breathe and optimistically look towards her future. Hope is an 8 or 9 year old retired law enforcement K9 who should have been able to spend the rest of her life dozing on the couch watching reruns of her favorite sit-coms. Instead she has spent the last week fighting for her life as she struggled to come back from the brink of starvation. T.A.R.A. is a local foster-based 501(c)3 pet rescue that is dedicated to helping the homeless animals of Hoke and Cumberland counties. Tax ID number for tax deductible donations is: 46-07364922. Donations for Hope’s care can be made via PayPal to: info@tararescue.org or directly to one of the two vets providing her treatment. Small Animal Emergency Animal Clinic, 5091 US-1, Vass, NC 28394, (910) 246-0405. Pine Tree Animal Hospital, 2352 NC-5, Aberdeen, NC 28315, (910) 944-7892. Have you found out what agency she was retired from? They should step up and take care of one of their own. There is an ongoing investigation with the Hoke County Sheriff’s Department. We do not have access to any information on her work history at the moment. The department she worked for is not at fault. She was, to the best of our knowledge properly adopted out according to whatever rules that agency has in place. We will keep you, Hope’s supporters, updated with whatever information we receive. We will contact her former department as well so they are aware of her condition when that information is available. 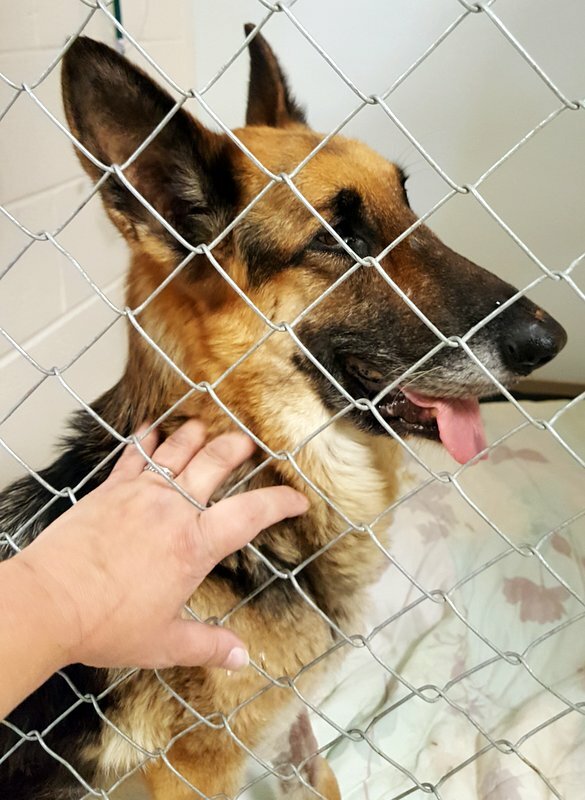 Your comments are “assumptions.” We should know who the department this dog worked for, and the vet who is NOT helping this beloved dog on a gratis (no cost) basis! I can appreciate your vehement championing of Hope. Every single one of us at T.A.R.A. is dedicated to one single mission: to restore Hope to full health. Our vets have been very generous with the costs on Hope’s care. No one can expect more than a week’s worth of intensive treatment to be free. Our comments and our actions have all been based on the information we received from the Hoke County officials. With an open investigation, one cannot expect to have all the answers up front. We will update everyone with as much information as we have, as soon as we have it. All vets would love to have the ability to treat pets at no cost to those taking care of the animals, especially those who have gone through tremendous trauma, but that would asking staff to pay for the treatment out of their own pocket. The money has to come from somewhere- drugs, supplies, utilities, payroll, none of it is free. They can’t afford to take that on, just as the rescue can’t, or any one person who doesnt have thousands of disposable income. Please be more empathetic towards those who are doing their very best with the situation at hand. i pray the people responsible for doing this to this beautiful animal will be prosecuted for this. We agree! And we will follow through with whatever we can to ensure Hope receives justice. Grateful for the quick action of TARA and the veterinary professionals who are working this Memorial Day weekend to save Hope’s life! There is nothing more loyal, intelligent and hard working than a German Shepherd. Glad someone is returning the blessing to her for her years of law enforcement service. Has anyone said they will take her in? please where can we find more info about her. I live in Fayetteville but have a farm in Vass. I hope getting her into a good home can happen ASAP. A place where she can get the love and care she needs. Thanks for the links to the vets. First, thank you for your devotion to Hope. While we have worried, the prayers and support from everyone has helped keep us, and by extension, Hope, positive and looking forward. Hope still has a long road to recovery before we are able to even consider adoption for her. After her forecasted month of recovery, we will need to check on the standard dog issues we face here in Hoke County. She will be checked for heartworms and treated if positive which is highly likely. That treatment is another monitored month of crate rest. Right now she is in a safe foster home with one of the vet techs that has been a part of her treatment team since the very beginning and we believe that right now this is the best place for her. As soon as we find out more about her or have updates on her condition, we will post both here and on our Facebook page. I would love to adopt her. I have a 5 year old German Shepard and i can promise she is spoiled beyond spoiled. I would love to give Hope the same type of life. I live in Louisiana and will make the trip to NC to get her. I am so very shocked by this . I am sending prayers. We are working on checking on a tattoo, but I do not recall seeing one when I visited her. Please send information on adoption paperwork. We still have quite a road ahead of us with Hope before she will be ready for adoption. We will keep you updated! I’m praying for God to help restore Hope’s health and heart in a quick and timely manner. I also thank God for the person(s) who rescued her from this horrific I’ll fate she was placed in and for those giving her the care and love she most deservingly should have always received, I pray God blesses each of you in the most beautiful way. Hope, I will keep you in my thoughts and prayers and look forward to seeing you back to your beautiful, amazing and healthy coat of fur in no time at all. If you need help, ask for it. Anyone who has a heart will be willing to help! This makes me sick to my stomach and angry. I am a big animal activist and this animal has saved and protected people as a canine officer and this is the kind of thanks you give in return. I hope who ever did this gets his just return and full prosecution. You need some help, Please Get It!!! I would love to apply to adopt Hope when the opportunity becomes available. I live n Virginia and could easily come back to Carolina if need b for future court appearances. I’ve been looking for an older GS…since I’m at home 95% of time. Thank you for your help n keeping her alive. Shes beautiful! Which of the two vets listed above has the larger balance for treatment of Hope? I would like to make a donation. My thoughts on the person(s) responsible for this is that there is a special place in Hell for them. Does she have a Facebook Page? No, we have not set up her own Facebook page, but will update everyone here and on our Facebook page. I just made a small donation, and wish it could be more. My prayers for Hope. And yes, I believe whatever agency she worked for should step and be responsible. No matter whatever safe and good home they believed they were sending her to. Most law enforcement agency’s I know of have a “we take care of our own” philosophy. Poor Hope. Thank you for taking in and caring for this beautiful furbaby. My daughter and son-in-law also saw the post and would love to adopt her when she is ready. Both of them are military police and my son-in-law is a canine handler. I am willing to pick her up and transport her to their current duty station. Please keep us updated to her status and when she will be ready for her furever home. Thank you.